Last week the report of the Education Select Committee stated that “current evidence does not allow us to draw conclusions on whether academies in themselves are a positive force for change”. It added that “academisation is not always successful nor is it the only proven alternative for a struggling school.” This was not exactly a ringing endorsement of the academies programme, coming as it did from a committee chaired by Conservative MP Graham Stuart and with a majority of members from the coalition. Yet today David Cameron will announce that any school rated by Ofsted as “Requires Improvement” or “Inadequate” will be subject to conversion to an academy. The Telegraph noted that almost 4,000 schools currently have one of these ratings (though some of these are of course already academies). It is hard to see where the evidence is that this is a sensible focus or use of resources. My extensive analysis for this site has repeatedly found, that when sponsored secondary academies are compared to similar non-academies, there is no evidence of faster improvement. This was effectively accepted by the DfE in a High Court case last summer where they claimed only that results for academies were “marginally higher” than other similar schools – and then only if GCSE equivalents (now removed from the benchmark figure) were included. My analysis, the detail of which has never been challenged by the DfE or their supporters, showed that once the equivalents were stripped out, sponsored academies actually performed worse than similar non academies. The release of the 2014 GCSE data last week confirmed this with results falling much more in sponsored academies than in similar community schools. Conversion of primary schools to academy status is more recent and, as a result, there has been less research. Indeed the Education Select Committee stated that there was “no convincing evidence of the impact of academy status on attainment in primary schools”. At the time that it was taking evidence there had only been one year of figures for any significant number of primary academies. 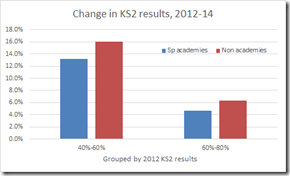 However last May the TES concluded that “academy conversion does not raise primary test results”, based on the first LSN analysis of primary academy results, comparing KS2 figures from 2012 to 2013. 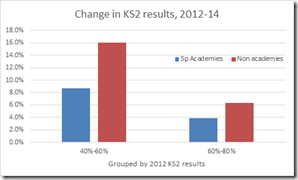 The 2014 school-by-school KS2 results were released in December and so it is now possible to analyse the performance of sponsored primary academies over two years. It is clear that academy conversion leads to slower improvement in the first year of conversion. However academy proponents might have a case if the academies grew more in subsequent years. In fact the evidence is of slower growth in the first year and similar growth after that, leaving the sponsored academies behind their comparable non-academies. The first analysis compares those schools which, at the time of the 2013 results, had been sponsored academies for at least six months. The second is for those who converted in the first six months of 2013, to see if having only jsut converted makes a difference. 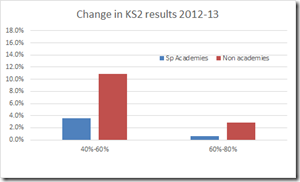 The DfE data on KS2 results allows us to compare the growth of sponsored academies and non academies. To ensure similar schools are being compared, I have grouped the sets of schools by their 2012 results (as schools with a lower starting point tend to grow at a faster rate). These graphs only include primary schools with at least 25 children in Year 6, to avoid the big % changes that can happen in schools with small numbers of students. It is clear that in the immediate period after conversion, the results of sponsored academies increase at a slower rate than similar non-academies. 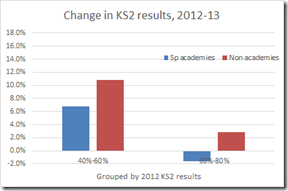 Non-academies in the 40-60% band grew their results by 10.8%, compared to 3.6% for sponsored academies. In the 60-80% band, the figures were 2.8% against 0.6%. Note: The data for sponsored academies is based on 76 primary schools, with at least 25 children in Year 6, that became sponsored academies by the end of 2012. There were 27 in the range 40-60% and 42 in the range 60-80%. (There were also 3 that were below 40% and 4 that were above 80%, too small a number to make comparisons in those bands). Again, over two years, the non academies clearly improved their results at a faster rate. Note: In this data, there were 33 sponsored academies in the 40-60% band for 2012 results and 60 in the 60-80% band (as well as 4 below 40% and 8 above 80% in 2012). David Cameron is proposing that poorly rated schools should be converted to academies. In fact the evidence shows this will slow their improvement. Instead of a massive disruption of our schools for a solution for which there is no evidence, the DfE should research – as a priority – what it is that enabled the above maintained schools to improve at such a fast rate. Perhaps, after 5 years of ideology-driven structural changes to our schools, it is time for evidence-based policy. This analysis is solely about “sponsored academies”, which are generally conversions of “under-achieving” schools. As David Cameron is referring to schools rated “Inadequate” or “Requires Improvement”, these will become sponsored academies. The other category is “converter academies”, which covers the conversion of schools that were generally already successful. A school is treated by the DfE as a new school after conversion and the tables do not include previous results as a maintained school. The analysis therefore involved using the information in the academies spreadsheet (which includes the reference number of its previous school) to link results as an academy and as its predecessor school. Sponsored academies which are the outcome of two predecessor schools are not included in the analysis. Janet, that is quite a quote. It is so condemnatory that I wondered if you'd made it up! But there it is, word for word, in the report. And this from a group of MPs with a coalition majority! That's not quite what's in the report. It is not 'clear' at all. The Committee said it was an aim for ‘a self-improving school system’ to raise standards 'through competition or through collaboration.' But it did not say this aim had been fulfilled. The Committee said evidence pointed towards competition being seen as a driver not that it was a driver. The Committee contradicted this perception by citing the OECD: collaboration, not competition, was the ‘key’. The DfE’s said academisation had challenged ‘many maintained schools to improve’. The Committee thought academisation had indeed ‘laid down a challenge’ to maintained schools to improve or face replacement’. (But it wasn’t the fear of replacement that persuaded the majority of secondary schools to convert – it was the perception of receiving more money). The Committee was NOT’ clear’ that academisation had incentivised local authorties to intervene more speedily and effectively. Its finding was tentative – academisation may have been an incentive not that it was. We should call conversion to academy status by what it really is - privatisation. The desire to privatise everything is the heart and soul of Conservativism and its cheap imitation - Blairism. Unfortunately Henry Stewart's excellent analysis of the failure of the privatisation of schools to raise standards is largely wasted, because Conservatives and New Labour have an unshakable faith in the dogma that the privatisation of a publicly owned organisation will always bring about improvements. Does anyone think that Labour would re-nationalise any of the institutions privatised during the last thirty years, or even prevent further schools leaving the public sector? Not likely - all the big political party are addicted to privatisation and whatever the result of the election the privatisation of our schools will continue. Don't be so gloomy. A broad front is gaining strength and pushing forward. Love the loaded words: 'monolith', 'barons'. Couldn't have written a better parody of anti-state education and pro-academy propaganda myself. What is so funny about these comments is the way in which the catalogue of free school and academy disasters has so totally by-passed them. Adrian - it's called blinkered vision. And a dogged determination to repeat statements which aren't true such as local authorities controlling schools.